Detached stone cottage and barn conversion which has recently been renovated to a high standard. 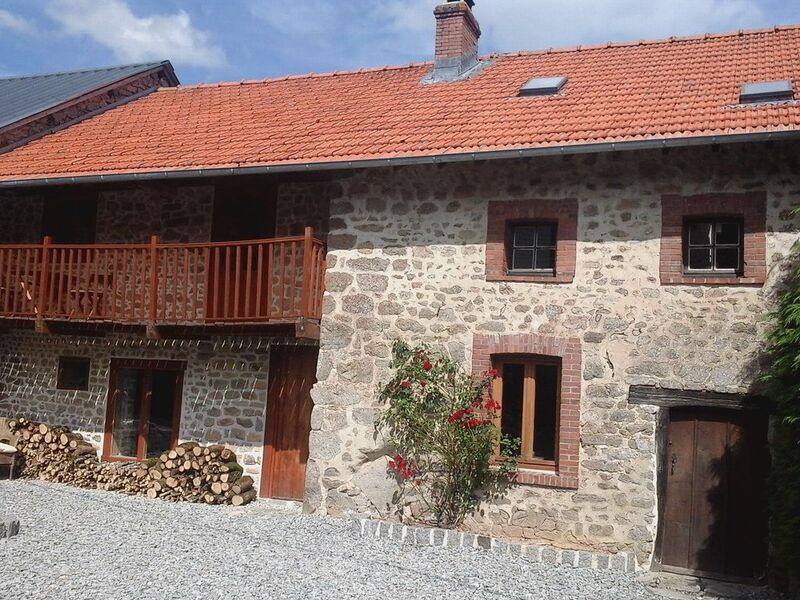 The property is situated in a quiet hamlet of a few houses and is surrounded by open meadows, hills and forests. The ground floor consists of a large lounge (8x5m), fabulous well equipped kitchen (7x4m) and a further reception room (30sq m) now fully finished that makes for a brilliant children's playroom and summer lounge. It retains a wealth of original features. On the first floor is the master bedroom with en-suite facilities, separate dressing area and access to a balcony and a further large double bedroom and separate house bathroom with shower and roll top bath. On the second floor there are two further double bedrooms and a twin bedroom. Outside is a large patio area, BBQ and grounds of over an acre. En-suite bathroom with shower to bedroom 1. Bathroom with shower cubicle, roll top bath and wc. Child's wc to bedroom 5. Notes on accommodation: The property operates a no smoking policy internally! Outside: Large patio area with stone steps to garden with large table and BBQ. Fantastic views across the valley. Grassed area for ball games. Orchard to side of garden. Trampoline. During summer months an above ground pool is offered if all hirers require it. Please speak to owners for further details. Cleaning / Towels / Linen / Maid service: Linen and towels are included. Other: The second reception room is now fully furnished and makes a great children's play room with possibly the largest 'Thomas The Tank Engine' train set in the Creuse available for younger (or not so young!) guests to play with, and now also has satelite TV. THE DIRECTION THE OWNER GAVE TOOK US STRAIGHT TO THE COTTAGE, WE WERE SO PLEASED TO FIND A BEAUTIFUL HOLIDAY HOME IS WAS PERFECT FOR US, WE WERE A LARGE GROUP WITH CHILDREN. THERE WAS A SAFE LARGE FIELD, SWIMMING POOLE TRAMPOLINE TOYS & DVDS FOR THE CHILDREN TO PLAY WITH, THE INFORMATION FOLDER WAS GREAT FOR DAYS OUT. WE HAD WONDERFUL TIME AND HOPE TO BOOK NEXT YEAR. Mousseau is the perfect place for a large family gathering. We were 12 in all, and there was something for everyone, with a large garden, trampoline, swimming pool, extremely well equipped kitchen, spacious accomodation, and lots of toys to play with! We ate almost every meal out of doors, enjoying the view over the surrounding countryside, and it was so quiet that one member of the family (a city dweller) complained that she couldn't sleep! We made use of the "reference library" to find local walks, markets to visit, and things to do. We sampled the famous Limousin beef, and bought huge quantities of bread, wine and cheese. We particularly enjoyed a visit to St Dizier, where the local hunt was showing off their horsemanship and the skills of their hounds. Limoges is well worth a visit too, particularly its cathedral, and of course its world-famous china industry. Despite being in the "middle of nowhere", we had no trouble following the owner's directions. The house was immaculate when we arrived, and I hope we left it in the same condition! I would recommend Mousseau to anyone wanting peace and quiet in a beautiful part of France, and I would like to thank the owners for giving us a superb holiday. Number of choices for rivers and lakes. Nearest swimming lake is at St Dizier Leyrenne with small beach approx 5 mins by car. Far greater water/beach facilities at Lac Courtille, Gueret about 25 mins away by car. Includes paddling pool with fountain, children's play area, extensive trim trail, BBQ area, water sport facilities and cafe. Great children's club runs July/August with numerous activities. Lac Vassiviere is even better with numerous beaches and water sports, about 40 mins away. Approximately 400 miles drive from channel ports. Nearest airport is Limoges which is about 1 hours drive away. Flights from East Midlands, Stansted, Liverpool, Bournemouth, Southampton, Leeds and Edinburgh. TGV train to Limoges and La Souterraine (about 25 minutes away). Aulon (approx 3 miles) has a small corner shop. St. Dizier Leyrenne (approx 3 miles) has small shop and bakery. Benevent L Abbaye (approx 7 miles) has supermarket, bar, restaurant, bank and a few shops. Bourganeuf (approx 9 miles) is larger and has supermarkets, bars, banks, shops, restaurants and market. Gueret (approx 14 miles) is the capital of the Creuse region and has extensive facilities. Vans selling bread and groceries serve the hamlet most days. The property is a great place to unwind with walking or cycling in the immediate vicinity or take advantage of the many activities and attractions locally. Labyrinthe Geant (lots of fun can be had at this maze of over four kilometres with quiz clues to help you round). Horse riding at St Dizier Leyrenne. Bosmoreau le Mines - velorail on 10kms of disused railway track. Arbre de Arbre at Lac Vassiviere, a treetop adventure course (not for the faint hearted) with 7 different runs for different age/height groups. Wolf park at Gueret is worth a visit. Also there are a number of historic villages and towns. There are a number of markets in the area selling local produce. Booking Notes: A 25% deposit is required at time of booking. The final payment is due 8 weeks before arrival date. Also payable is a deposit of £200 in respect of damages or breakages. We accept payment by cheque. We would consider longer term lets out of season at a discounted rate. Changeover Day: Changeover day is Saturday during July and August with flexibility outside these months. Arrival after 4pm and departures before 10am.